Villa, 4 Bedrooms, 2 Baths, Sleeps 8. Free Internet Access, HD Cable, and Free Long Distance Calls (within USA). Read what our guests say about this property in the Reviews section. living room, fully tiled bathrooms and kitchen. 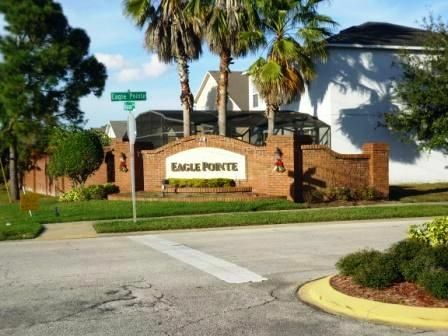 Located just off Poinciana Boulevard, within 10 minutes of Disney, with easy access to Highway 192 attractions, shops and restaurants. Luxury 4 bedroom lakeside villa, with private south facing pool, capturing maximum sunshine, with a shaded outdoor dining area. Pool overlooks a lake and conservation area. Personally furnished to a high standard, comprising widescreen cable tv, CD/Radio system, full air conditioned. Two Queen sized bedrooms, two twin rooms, including Disney character themed bedroom. We do keep our availability calendar up to date, and we aim to respond to all inquiries promptly. Have been renting vacation homes in Central Florida for more than 25 years, after first visiting Florida in 1993 with family. We use our home for our own vacations as well as renting out the property. Lovely lakeside plot, overlooking a lake and conservation area. Villa has an extended, south facing pool deck in a residential area, close to all the major attractions in the Kissimmee area. The close proximity to wildlife and a quiet environment make this an excellent choice to relax and unwind after a day out at the parks. The property is only a few minutes from the restaurants and shops on Highway 192. Beautiful view of lake and conservation area from the extended pool deck area. South facing. Electric pool heat is available at $20 per day. Fully Air Conditioned, Interactive HIGH DEFINITION (HD) Cable TV, Stereo, Telephone. FREE LONG DISTANCE CALLS (Within USA). Fully fitted Kitchen, Microwave, Dishwasher, Refrigerator, Ice Maker. Washer & Dryer are available for guest use free of charge to help keep luggage to a minimum. All Linens & Towels provided. Double size Garage. Patio dining table and 4 x's Luxury Sun Loungers are avialble on the extended pool deck area overlooking the lake. Loved it ! Everything there! We all loved the comfort of this home. Felt like home! Clean, well looked after! Owner replied to all questions very quickly. Just a simple email . Also key accessibility was the best. Did not have to drive somewhere else to get it. Only thing I missed was a bbq. But when we went through the book left in a kitchen cupboard we discovered that we could have had one delivered .Furniture very comfortable and lots of seating indoor and out. Lots of towels for shower and pool. Pool was clean and beautiful to sit out overlooking the pond with turtles and birds all around. Everything you could possibly want in the kitchen . I do a lot of cooking and I cannot think of one thing that I needed that wasn’t there. We truly enjoyed our time and will definitely come back !! Thank you Michael! Thank you Shelley for your positive feedback and kind comments. It is really pleasing to learn that you enjoyed your stay and would return again. Hopefully you will be able Florida in the not too distant future. We all loved the place!! Home is roomy Mike our host was always available very helpful. Great big home, great location, great owner/managers too. We had a great time spending all day in the parks. 9nly wish we had more time to enjoy the crow nest. Thank you Mike for sharing your home! Pleased you had a good time in Florida and enjoyed our vacation home. Great big home, great location. We were very busy at the parks all day. Only wish we had more time to enjoy the crows nest. Managers were very helpful too.thank you Mike for sharing your home! Glad you enjoyed your stay, Lori. A vast range of Shops, Restaurants and the '192' attractions are within 5 minutes drive.